Touchscreen Controls: Built-in, Intuitive software with touchscreen controls ensures consistent cooking times and temperatures. Preset cooking steps are easy to follow, even for inexperienced operators. Programmable Controls:Microprocessor controls are programmable for simplified operator operation. Offers flexibility for future menu items and product specification changes at the restaurant level. External USB Port: External USB port allows user access to upload new menu and promotional items. Menu changes can be sent electronically to other store locations saving time and eliminating operator error. 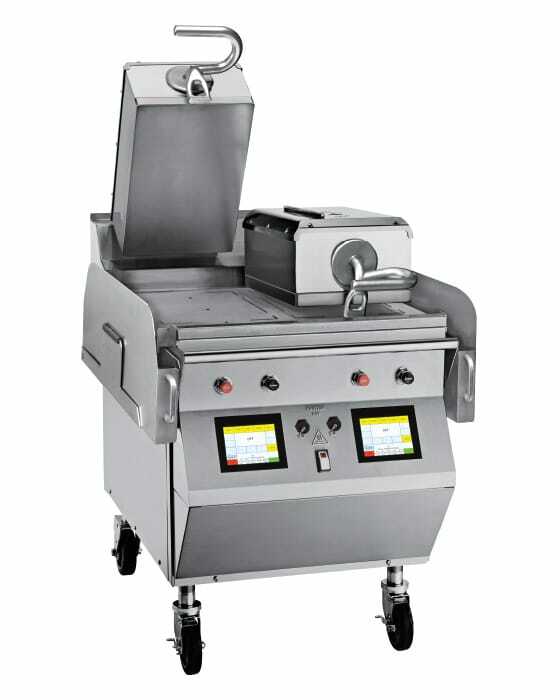 Automatic Calibration: The grill automatically recalibrates itself daily so cooking temperatures remain consistent. Standby Alert: Standby feature incorporated into the grill gives audible reminder to place an idle paten into standby mode. This feature reduces operating energy by up to 40 percent compared to full operation mode. Four Flat Timer:Turns a 12-inch cooking area into four separately timed cooking zones, managed by a built-in timer. Improves speed of service. Fault Log: Integrated fault log Improves technician diagnostics by making troubleshooting easier. Also validates downtime occurrences.